The statement came not long after Guaidó declared himself “acting president” during a mass protest against Maduro’s presidency. In Pence’s taped message, he lambasted Maduro, describing him as a dictator who has no rightful claim to power. Venuezula is one of three socialist countries, along with Cuba and Nicaragua, that have been dubbed by the Trump administration as the “Troika of Tyranny.” In a speech in November last year, U.S. national security adviser John Bolton described the countries as a “triangle of terror” and imposed sanctions on Venezuela and Cuba, while vowing to punish Nicaragua. Pence called out Maduro’s regime and urged Venezuelans to ramp up their protests. Venezuela’s opposition held marches nationwide Jan. 23 as part of an annual event that marks the fall of a military government in 1958. Government critics are increasingly comparing Maduro to dictator Marcos Perez, who was ousted from power that year. The U.S. embassy in Caracas, Venezuela, didn’t immediately respond to an emailed request for comment about the situation. In his taped message, Pence said the United States won’t rest until democracy is implemented in the country. “As you make your voices heard tomorrow, on behalf of the American people, we say to all the good people of Venezuela: Estamos con ustedes,” he said. Maduro was inaugurated Jan. 10 amid worldwide condemnation that his leadership is illegitimate, following a 2018 election that was widely viewed as fraudulent. Maduro, who gained power in 2013, is now in his second term. 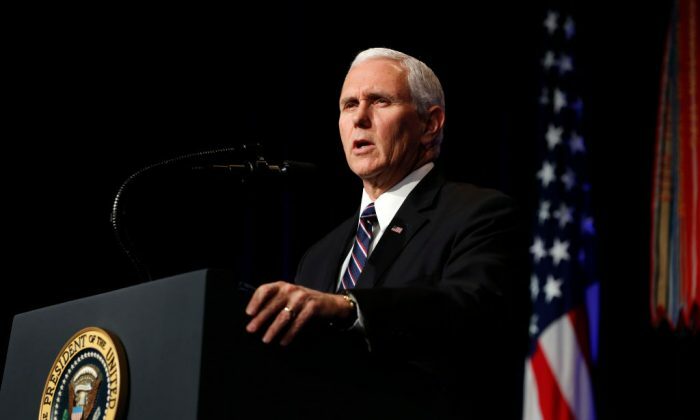 Just last month, Pence spoke on the phone with Guaidó and said the National Assembly he leads is the “last vestige of democracy.” He vowed to continue supporting Guaidó’s decision to assert the body’s powers, declare Maduro a “usurper,” and to push for a transitional government to be established. In response, Maduro accused Pence of trying to force a coup and said he had ordered a revision of Venezuela’s diplomatic relations with the United States. “Never before has a high-level official said that the opposition should overthrow the government,” Maduro told a news conference. Just days prior, Venezuela’s government claimed to have foiled an attempted military insurrection. Meanwhile, tens of thousands of Venezuelans took to the streets Jan. 23 in a bid to force Maduro from office, claiming that he’s devastated the country’s economy and created a humanitarian crisis. Early in the day, protesters in eastern Caracas shouted out in unison, “Who are we? Venezuela! What do we want? Freedom!” Other protests across the country were planned as well. Riot police, water tanks, and the light armored vehicles had all been deployed at the central Plaza Venezuela square. Guaidó repeated calls for members of the security forces to withdraw their support for Maduro. “The world’s eyes are on our homeland today,” he said in a tweet. Venezuelan security forces put down a pre-dawn uprising on Jan. 21 that triggered violent street protests.